Transdev Ireland operate the Light Rail Transit System in Dublin called Luas. Transport Infrastructure Ireland (TII) is the state body responsible for Luas. There are two Luas tram lines, the Red Line and the Green Line. The Red Line is 20kms in length and has 32 Stops. The Red Line runs from Tallaght to The Point and from Saggart to Connolly. The Green Line is 24.5km in length and has 35 Stops. The Green Line runs from Brides Glen to Broombridge. What are peak times and off peak times? Peak and Off Peak times can refer to service frequency and or fares. Fares: Peak fares apply 7am to 10am and 4pm to 7pm Monday to Friday excl. Saturday, Sunday and Bank Holidays. Off peak fares apply all other times. How can I purchase a single or return ticket? Ticket Vending Machines are located at every stop. They accept coins, notes and debit/credit cards, and also give change. Please note that tickets may not be purchased onboard the trams. You must have a valid ticket at all times on board the tram. What do I do when issued a refund ticket? You've been issued a refund ticket from our ticket vending machine (T.V.M) instead of correct change; this is usually due to that machine running out of coins. If this happens you have two options, you can go to the depot at the Red Cow or Sandyford Stops between the hours of 9am and 5pm Monday to Friday and we can issue you with your refund or you can post this ticket in to our address (found in the contact us section) along with your name and address so we know where to send it back to. Will my travel pass cover my fare for travelling on the Luas? Yes. If you are a holder of a social welfare travel pass (smart pass for Northern Irish holders).Pass holders are permitted to free travel on Luas, we ask that you have your pass on your person at all times as tickets are regularly checked on board trams and you will need to present this if requested. If your pass states that it is a companion pass it is ok for your companion to travel freely with you for your journey. If you have any other questions please contact Luas Customer Care. Where do I find out information on Standard Fares? Can I take a bicycle on board the tram? Only foldable bicycles stored in a carrier bag may be brought on board. Otherwise no bicycles are allowed. This is stated in our Bye Laws. Where are the cycle parking facilities? Check the stop you are travelling from for cycle rack facilities. Are animals allowed on Luas? Guide Dogs are allowed on Luas. Other dogs and animals are allowed on the tram provided they are in an appropriate enclosed pet carrier case / box. Their travel is at the discretion of Luas Staff. Where can I cross the track? There are designated crossing points at each Stop, where the track is level with the pathway. In the city you should also cross at pedestrian crossings, which usually cross roads and LUAS lines. Remember to use the Safe Cross Code when crossing. What do I do if I need assistance on board the tram or at the Stop? Passengers requiring assistance should call LoCall 1850 300 604. On board the tram there is an emergency passenger communication device, located on a doorpost to the right side of every pair of doors; this enables a passenger to speak directly with the driver. There is an emergency brake lever located at every door which will cause the tram to Stop in the event on an emergency. False activation of the emergency brake will result in a fine. There is an Emergency Help Point at each Stop. Text LUAS to 51444 to report Anti-Social Behaviour. Press the large Red button once. This will connect you to the control room. The CCTV system at the Stop means the staff can see who has pressed the button. The staff member and the passenger who requires assistance can now speak to each other. Please note there is CCTV on board the tram and at the stop. How do I transfer between lines? Below are examples of how to transfer between lines. 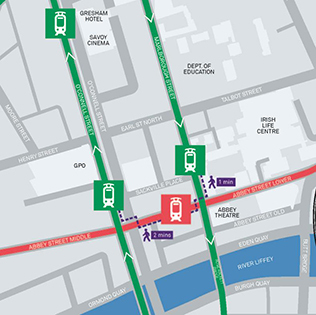 Travelling north on the Green Line get off the tram at O’Connell - GPO stop, walk 2 mins (140m) to Abbey Street stop and board a Red Line tram westbound to Saggart or Tallaght or eastbound to Connolly or The Point. Travelling eastbound on the Red Line get off the tram at Abbey Street stop. To travel north walk 2 mins (140m) to O’Connell - GPO stop and board a Green Line tram northbound to Parnell or Broombridge. To travel south walk 1 min to Marlborough stop and board a Green Line tram southbound to Sandyford or Brides Glen. How long will it take to get from Broombridge to The Point? The tram from Broombridge to Marlborough will take approximately 18 minutes. From there, walk 1 minute to the Abbey Street stop and take the tram east to The Point. The tram will take 11 minutes and the 3Arena is located beside the stop at which you alight. How long will it take to get from Heuston to Dundrum Town Centre close to Balally stop? How will Luas Lines operate? What are the approximate journey times? Brides Glen to Parnell = 56 minutes approx. Brides Glen to Broombridge = 1 hr 9 minutes approx. Sandyford to Parnell = 37 minutes approx. Sandyford to Broombridge = 50 minutes approx. St. Stephen's Green to O'Connell - GPO = 9 minutes approx. St. Stephen's Green to Broombridge = 25 minutes approx. O'Connell - GPO to Broombridge = 18 minutes approx. What are the key interchanges with regional and local train stations? Luas interchanges with regional and local train stations are highlighted at stops. What are the nearest DART stops to Luas stops? For information on transport connections from each Luas stop check out the TFI National Journey Planner. Are there interchanges with Irish Rail at Luas stops? Where do regional bus services connect with Luas? Luas interchanges with regional bus services at the following locations. Details of more regional bus stops close to Luas stops are shown on the map in the stop section of this website. We advise on using the TFI National Journey Planner for wayfinding. Information on the Ticket Vending Machines? The Ticket Vending Machine (TVM) takes coins, notes, debit/credit cards, it also gives change. Luas Ticket Machines are accepting debit/credit card transactions to a maximum of €150.00 per week. Transactions that are less than €30 cannot be paid for with a €50 note. This is because the machine dispenses coins only for change. It sells all types of tickets except annual tickets, Taxsaver tickets. There are a minimum of two TVM’s per stop. In the case of the machine being out of order please notify our Customer Care Team on LoCall 1850 300 604. Please use another ticket vending machine to purchase a ticket. You must have a valid ticket at all times on board the tram. What height and power are the overhead wires? The overhead wires contain 750vDC and are up at 6m unless indicated otherwise. Are the wires off at night? No. The system is live at all times, unless it’s an emergency or planned works are to take place. Yes – If you interfere with electricity – come in to contact with the overhead cables, or damage any of the electrical cabinets near the tramway. Can I drive in tram lanes? No. Tram lanes marked LANA TRAM are specifically for trams only and can not be used by any other road users including buses, taxis or cyclists. Will I have to pay at the Park and Ride car parks? You must have a valid Luas ticket on the day you park. An additional charge will occur if you do not have a valid Luas ticket when you leave the car park. Ticket Machines accept 10c, 20c, 50c, €1, €2 and debit/credit Cards. Payment must be made before you make your journey. What age range is covered on a child fare? Can I make group orders? Luas can offer you the option of purchasing group tickets. We can sell 1 day flexi and return fares for groups of 20 people or more. Orders must be received at least 5 days before date of travel. Payment methods are debit/credit card, cheque or postal order. Please call Luas Customer Care on LoCall 1850 300 604 for further information. At what time are the last trams? How do I get from Connolly to Busáras? Busáras Stop is a 3 minutes (approx.) walk from Connolly Stop. How do I get from Saggart to The Point? Most trams from Saggart will serve all stops to Connolly. Going to the city centre to get to The Point change to any tram marked The Point at any stop after Fettercairn. Or Use the recommended interchanges: Belgard or Busaras if you wish. Check the on stop passenger information and the on tram displays for information. I need to get to Tallaght Hospital from Fettercairn, how do I do it? To get from Fettercairn to Tallaght Hospital you have to change at Belgard Interchange and board next tram going towards Tallaght. There is no change to the way you Touch On / Off your Leap Card on Luas. You should to Touch On before you get on the tram and Touch Off after you get off the tram. If you are using both lines our best advice is to Touch On and Off for the 1st tram trip and then after you change lines Touch On and Off for the 2nd tram trip. By Touching On/Off for each tram trip you will get the best value fare for your overall journey, you will have a valid ticket and you will have the flexibility to change your mind about the 2nd part of your journey. You can also Touch On before the 1st tram trip; change trams and Touch Off after the 2nd tram trip but be careful to not Touch Off or On by accident. Can I use both lines, Touch On before 1st tram trip and Touch Off after 2nd tram trip? Yes, you can Touch On before the 1st tram, change trams and Touch Off after the 2nd tram on the other line. However, you need to be very careful to not Touch Off or On out of habit between changing trams. If you do, you run the risk of not having a valid ticket and you may get a Standard Fare of €45 increasing to €100 if not paid in 2 weeks. You also may not get the best value fare for your overall journey. You also must complete this journey within 180 mins. If you Touch On before the 1st tram, don’t touch off and then for some reason don’t take a 2nd tram and Touch Off within the 180 mins timeline or don’t take a 2nd tram at all you will automatically be charged the maximum 5-8 Zones Leap Card fare; peak or off peak depending on the time of the day. Always check the Validator screen and listen for the Validator beep to confirm you have Touched On or Off correctly. I use both lines and 5 zones. Can I touch On and will the system Touch Off my Leap Card? If you Touch On before the 1st tram and do not Touch Off, you have a ticket valid for travel on both Luas lines for 180 mins. After 180 mins, the system automatically Touches Off your Leap Card. You will automatically be charged the maximum 5-8 Zones Leap Card fare; peak or off peak depending on the time of the day. What happens if I Touch On before my 1st tram forget to Touch Off and Touch On before my 2nd tram? If you Touch On before your 1st tram, forget to Touch Off and then validate your Leap card before your 2nd tram you will actually be Touching Off. Because you forgot to Touch Off after your 1st tram the next time the system sees your Leap Card it will Touch Off the system. You Leap Card will not have been Touched On so you will not have a valid ticket for travel and you may get a Standard Fare of €45 increasing to €100 if not paid in 2 weeks. What happens if I Touch On before and Touch Off after my 1st tram then Touch On before my 2nd tram but forget to Touch Off after my 2nd tram? In this case, you will have Touched On for the 2nd part of your trip but not Touched Off. The same thing happens as happens now. If you Touch On before a tram trip but forget to Touch Off after that trip you will automatically be charged the maximum 5-8 Zones Leap Card fare; peak or off peak depending on the time of the day.